Fresh jalapeños and grated jalapeño cheese bring nice heat to the pork tenderloin. Cut tenderloin lengthwise almost in half. Lay out flat. Chill. Combine next seven ingredients in food processor; puree. Add olive oil slowly until mixture thickens. Spread half of mixture over tenderloin. Spread grated cheese over pesto. Reform tenderloin and tie to secure. 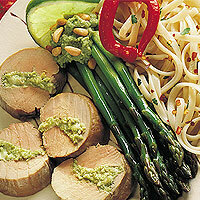 Spread remaining pesto over tenderloin. Chill for several hours. Preheat oven to 400 degrees F. Place tenderloin on a rack in a shallow baking pan and roast until firm, about 20 minutes. Remove from oven, cover and keep warm. Let rest for 10 minutes, reserving all juices. Remove string from tenderloin and cut into eight slices. Arrange on plates. Pour any warm juices over slices. Sprinkle with toasted pine nuts to serve.